In 2015 the Aircraft Production was worth $180.3 Billion: 61% airliners, 14% business and general aviation, 12% Military aircraft, 10% military rotary wing and 3% civil rotary wing; while their MRO was worth $135.1 Bn or $315.4 Bn combined. The global aerospace industry was worth $838 billion in 2017: Aircraft & Engine OEMs represented 28% ($235 Bn), Civil & Military MRO & Upgrades 27% ($226 Bn), Aircraft Systems & Component Manufacturing 26% ($218 Bn), Satellites & Space 7% ($59 Bn), Missiles & UAVs 5% ($42 Bn) and other activity, including flight simulators, defense electronics, public research accounted for 7% ($59 Bn). The countries with the largest industry were led by the United States with $408.4 Bn (49%) followed by France with $69 Bn (8.2%) then China with $61.2 Bn (7.3%), United Kingdom with $48.8 Bn (5.8%), Germany with $46.2 Bn (5.5%), Russia with $27.1 Bn (3.2%), Canada with $24 Bn (2.9%), Japan with $21 Bn (2.5%), Spain with $14 Bn (1.7%) and India with (1.3%): the top 10 countries represent $731 Bn or 87.2% of the whole industry. In 2018, the new commercial aircraft value is projected for $270.4 billion while business aircraft will amount for $18 billion and civil helicopters for $4 billion. 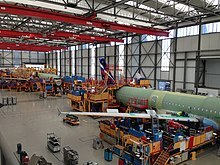 In September 2018, PwC ranked aerospace manufacturing attractiveness: the most attractive country was the United States, with $240 billion in sales in 2017, due the sheer size of the industry (#1) and educated workforce (#1), low geopolitical risk (#4, #1 is Japan), strong transportation infrastructure (#5, #1 is Hong Kong), a healthy economy (#10, #1 is China), but high costs (#7, #1 is Denmark) and average tax policy (#36, #1 is Qatar). Following were Canada, Singapore, Switzerland and United Kingdom. Within the US, the most attractive was Washington state, due to the best Industry (#1), leading Infrastructure (#4, New Jersey is #1) and Economy (#4, Texas is #1), good labor (#9, Massachusetts is #1), average tax policy (#17, Alaska is #1) but is costly (#33, Montana is #1). Washington is tied to Boeing Commercial Airplanes, earning $10.3 billion, is home to 1,400 aerospace-related businesses, and has the highest aerospace jobs concentration. Following are Texas, Georgia, Arizona and Colorado. In the European Union, aerospace companies such as Airbus, BAE Systems, Thales, Dassault, Saab AB, Terma A/S, Patria Plc and Leonardo are participants in the global aerospace industry and research effort. In Russia, large aerospace companies like Oboronprom and the United Aircraft Corporation (encompassing Mikoyan, Sukhoi, Ilyushin, Tupolev, Yakovlev, and Irkut, which includes Beriev) are among the major global players in this industry. In the US, the Department of Defense and NASA are the two biggest consumers of aerospace technology and products. 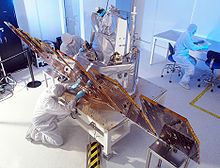 The Bureau of Labor Statistics of the United States reported that the aerospace industry employed 444,000 wage and salary jobs in 2004, many of which were in Washington and California, this marked a steep decline from the peak years during the Reagan Administration when total employment exceeded 1,000,000 aerospace industry workers. During that period of recovery a special program to restore U.S. competitiveness across all U.S. industries, Project Socrates, contributed to employment growth as the U.S. aerospace industry captured 72 percent of world aerospace market. By 1999 U.S. share of the world market fell to 52 percent. Important locations of the civil aerospace industry worldwide include Seattle, Wichita, Kansas, Dayton, Ohio and St. Louis in the United States (Boeing), Montreal and Toronto in Canada (Bombardier, Pratt & Whitney Canada), Toulouse in France, Seville in Spain and Hamburg in Germany (Airbus, EADS), the North-West of England and Bristol in Britain (BAE Systems, Airbus and AgustaWestland), Komsomolsk-on-Amur and Irkutsk in Russia (Sukhoi, Beriev), Kiev and Kharkiv in Ukraine (Antonov), Nagoya in Japan (Mitsubishi Heavy Industries Aerospace and Kawasaki Heavy Industries Aerospace), as well as São José dos Campos in Brazil where Embraer is based. Several consolidations took place in the aerospace and defense industries over the last few decades. BAE Systems is the successor company to numerous British aircraft manufacturers which merged throughout the second half of the 20th century. Many of these mergers followed the 1957 Defence White Paper. Airbus prominently illustrated the European airliner manufacturing consolidation in the late 1960s. Between 1988 and 2010, more than 5,452 mergers and acquisitions with a total known-value of US$579 billion were announced worldwide. In 1993, then United States Secretary of Defense Les Aspin and his deputy William J. Perry held the "Last Supper" at the Pentagon with contractors executives who were told that there were twice as many military suppliers as he wanted to see: $55 billion in military-industry mergers took place from 1992 to 1997, leaving mainly Boeing, Lockheed Martin and Raytheon.Boeing bought McDonnell Douglas for US$13.3 billion in 1996.Raytheon acquired Hughes Aircraft Company for $9.5 billion in 1997. Marconi Electronic Systems, a subsidiary of the General Electric Company plc, was acquired by British Aerospace for US$12.3 billion in 1999 merger, to form BAE Systems. In 2002, when Fairchild Dornier was bankrupt, Airbus, Boeing or Bombardier declined to take the 728JET/928JET large regional jet program as mainline and regional aircraft manufacturers were split and Airbus was digesting its ill-fated Fokker acquisition a decade earlier. On September 4, 2017, United Technologies acquired Rockwell Collins in cash and stock for $23 billion, $30 billion including Rockwell Collins' net debt, for $500+ million of synergies expected by year four. The Oct. 16, 2017 announcement of the CSeries partnership between Airbus and Bombardier Aerospace could trigger a daisy chain of reactions towards a new order. Airbus gets a new, efficient model at the lower end of the narrowbody market which provides the bulk of airliner profits and can abandon the slow selling A319 while Bombardier benefits from the growth in this expanded market even if it holds a smaller residual stake. Boeing could forge a similar alliance with either Embraer with its E-jet E2 or Mitsubishi Heavy Industries and its MRJ. On 21 December, Boeing and Embraer confirmed to be discussing a potential combination with a transaction subject to Brazilian government regulators, the companies’ boards and shareholders approvals. The weight of Airbus and Boeing could help E2 and CSeries sales but the 100-150 seats market seems slow. As the CSeries, renamed A220, and E-jet E2 are more capable than their predecessors, they moved closer to the lower end of the narrowbodies. In 2018, the four Western airframers combined into two within nine months as Boeing acquired 80% of Embraer's airliners for $3.8 billion on July 5. The largest aerospace suppliers are United Technologies with $28.2 Billion of revenue, followed by GE Aviation with $24.7 Billion, Safran with $22.5 Billion, Rolls-Royce Holdings with $16.9 Billion, Honeywell Aerospace with $15.2 Billion and Rockwell Collins including B/E Aerospace with $8.1 Billion. The electric aircraft development could generate large changes for the aerospace suppliers. On 26 November 2018, United Technologies announced the completion of its Rockwell Collins acquisition, renaming systems supplier UTC Aerospace Systems as Collins Aerospace, for $23 billion of sales in 2017 and 70,000 employees, and $39.0 billion of sales in 2017 combined with engine manufacturer Pratt & Whitney. Before the 1980s/1990s, aircraft and aeroengine manufacturers were vertically integrated. Then Douglas aircraft outsourced large aerostructures and the Bombardier Global Express pioneered the “Tier 1” supply chain model inspired by automotive industry, with 10-12 risk-sharing limited partners funding around half of the development costs. The Embraer E-Jet followed in the late 1990s with fewer than 40 primary suppliers. Tier 1 suppliers were led by Honeywell, Safran, Goodrich Corporation and Hamilton Sundstrand. In the 2000s Rolls-Royce reduced its supplier count after bringing in automotive supply chain executives. On the Airbus A380, less than 100 major suppliers outsource 60% of its value, even 80% on the A350XWB. Boeing embraced an aggressive Tier 1 model for the B787 but with its difficulties began to question why it was earning lower margins than its suppliers while it seemed to take all the risk, ensuing its 2011 Partnering for Success initiative, as Airbus initiated its own Scope+ initiative for the A320. Tier 1 consolidation also affects engine manufacturers : GE Aviation acquired Avio in 2013 and Rolls-Royce plc is taking control of Industria de Turbo Propulsores. ^ Kevin Michaels (April 28, 2016). "MRO Industry Outlook" (PDF). ICF International. ^ Lee Ann Shay (Jan 2, 2018). "Commercial Spending Will Lead MRO Field In 2018". Aviation Week & Space Technology. Comparing civil, helicopter, business aviation and military MRO forecasts for 2018. ^ a b "Top 100 aerospace companies by revenue 2017". Flight International. 3 Sep 2018. ^ a b "Top 100 aerospace companies grow more profitable". Flight International. 1 September 2017. ^ a b "Top 100 Special Report". Flight International. 13 September 2016. ^ a b "Top 100 Aerospace Companies" (PDF). Flight International. 15–21 September 2015. ^ a b "Aerospace manufacturing attractiveness rankings" (PDF). PwC. September 2018. ^ Parker, Dana T. Building Victory: Aircraft Manufacturing in the Los Angeles Area in World War II, pp. 131-2, Cypress, CA, 2013. ^ a b c Jens Flottau (Jul 12, 2018). "Aerospace Consolidation Anew: Now It's The Commercial Airframers". Aviation Week & Space Technology. ^ "Mergers & Acquisitions - Aerospace & Defense". Thomson Financial, Institute for Mergers, Acquisitions and Alliances. ^ Leslie Wayne (Feb 27, 1998). "The Shrinking Military Complex; After the Cold War, the Pentagon Is Just Another Customer". New York Times. ^ "Boeing offering $13 billion to buy McDonnell Douglas". New York Times. Dec 16, 1996. ^ "Raytheon wins bidding war for Hughes Aircraft". Flight International. 22 January 1997. ^ "All-UK merger sends European defence into disarray". Flight International. 27 January 1999. ^ Michael Bruno (Sep 18, 2017). "Northrop To Buy Orbital For More Than $9B". Aviation Week & Space Technology. ^ Jerrold T. Lundquist (Oct 18, 2017). "Opinion: C Series Deal Ends Aerospace Status Quo". Aviation Week & Space Technology. ^ Michael Bruno and Guy Norris (Dec 21, 2017). "Boeing, Embraer Mull Combination That Could Reset OEM Industry". Aviation Week Network. ^ Jon Hemmerdinger (6 June 2018). "Mergers may fuel long-awaited E2 and CSeries sales bump". Flightglobal. ^ Thierry Dubois and Jens Flottau (Jan 20, 2017). "Tier 1 Consolidation Continues As Safran Takes Over Zodiac". Aviation Week & Space Technology. ^ Michael Bruno (Dec 6, 2017). "Industry Landscape Could Reboot Under Aircraft Electrification". Aviation Week & Space Technology. ^ "United Technologies Announces Intention to Separate Into Three Independent Companies; Completes Acquisition of Rockwell Collins" (Press release). United Technologies. November 26, 2018. ^ a b Kevin Michaels (May 18, 2017). "Beware, OEM-supplier Relations Are Changing". Aviation Week & Space Technology. "Aerospace, Defense & Government Services – Mergers & Acquisitions (January 1993 - December 2016)" (PDF). Grundman Advisory. 6 Apr 2017. Jens Flottau (Feb 22, 2018). "Opinion: Airframers Should Watch Where They Squeeze Suppliers". Aviation Week & Space Technology.